In this week’s movie recommendation, Clint Eastwood makes a delightful play on his earlier career persona. He trades the brooding, solitary gunslinger for a much more vulnerable and aged Secret Service bodyguard in Wolfgang Petersen’s In the Line of Fire. Eastwood plays Frank Horrigan, a man bedeviled by his legacy as “the only active agent who ever lost a president.” It was he, JFK’s favorite, who blundered in Dallas on November 1963. When the Warren Commission confirmed his fears that indeed there was more—much more—he could have done to save the president, Horrigan descended into wretched drinking habits. Thirty years later, Horrigan responds to a mundane house complaint with his partner D’Andrea played by Dylan McDermott. Horrigan believes he hasÂ stumbled into the lair of a man with designs to assassinate the current president during a re-election campaign. He’s convinced the case belongs to him: he was the one to sniff the trail, and he’s best positioned to follow the clues.Â The snag, of course, is his legacy. Those around him at the Secret Service, including John Mahoney as the Director of the Service, are hardly inclined to unleash Horrigan on what’s probably just a small-time scare. He’s a liability, both for his drink and the walking PR disaster he represents. Yet this is no small-time scare at all. The villain here is sinister and deadly. John Malkovich plays the would-be assassin Mitch Leary, who styles himself with the pseudonym “Booth” as but one play on the irony of his role. Upon discovering that he’s to be pursued by Horrigan, Leary is overjoyed, rather than perturbed. “The stakes are higher now,” he delights over the phone. The Agency learns to take Leary, and in turn Horrigan, very seriously indeed. In the Line of Fire fashions itself as an ordinary cat-and-mouse flick. In many ways, that’s entirely accurate: consistent with the genre, much of the dialogue is devoted to the mechanics of pursuing a supremely competent assassin, and character development (at least of Malkovich’s character) is relatively subdued. Only those facets that pertain to the conspiracy itself warrant detailed treatment, and extraneous details are excised altogether. The love interest between Horrigan and a fellow Secret Service agent named Raines played by Rene Russo is stilted at first and becomes tender later, but even those scenes feel in place to serve the plot arch rather than as character development. Moreover, consistent with the genre, there’s an identifiable symmetry between the two protagonists. Leary enthusiastically reminds Horrigan that past sins may be redeemed depending on performance in this struggle. One of them will survive, this much is certain. But each one of them knows that their existence reluctantly depends on the other. We might as well refer to Leary as The Jackal, for all the parallels that Petersen tries to draw (see my review of Day of the JackalÂ here). But the cat-and-mouse theme isn’t all that’s going on. Petersen, of Das Boot fame, is as good as Eastwood at curating a film’s pace. At a runtime just exceeding two hours, In the Line of Fire holds your attention throughout, up until the closing credits. Even the limited treatment of some of the side characters, most notably Malkovich’s assassin and Russo’s bodyguard, detract little from the joy of watching Eastwood play around with the persona he had developed in his earlier, Spaghetti Westerns (see, for example, my review of A Fistful of Dollars, and relatedly, Once Upon a Time in the West). Gone is Eastwood’s taciturn violence of yesteryear. In its place, Eastwood portrays Horrigan with a petulance, despair, and vulnerability. Before, a casual glance from below the rim of his sombrero would have sufficed to lure any woman to bed; now, he finds himself woefully out-matched by the superior women he pursues like Raines. It’s a welcome change. 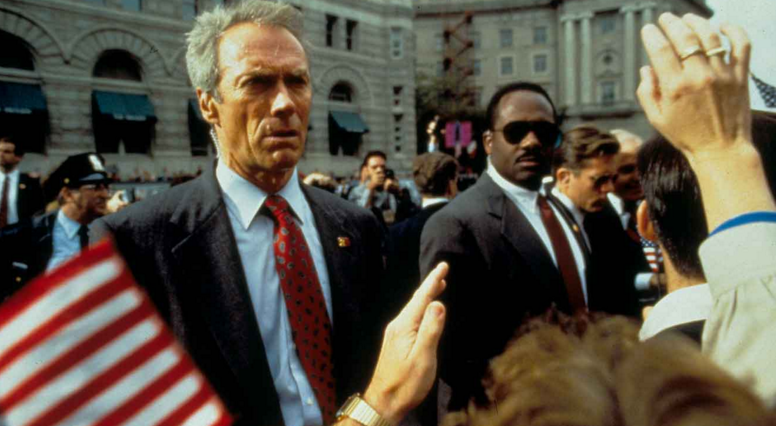 And it makes Eastwood the perfect casting choice for In the Line of Fire.